This very unusual surname is Scottish, and particularly Aberdeen, where it has enjoyed a small measure of popularity. It is also recorded as a plantation surname in Northern Ireland from the early 17th century. It derives from the gaelic adjective 'og' meaning 'young' and was originally given as a baptismal or nickname of endearment. 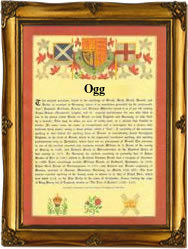 Today it is found in the surname spellings of 'Ogg and rarely Oag', having passed through 'Og, Uig, and Oge' on the way. The sept is part of the Clan MacGregor, and this in itself has been sufficent to guarantee the name both immortality and infamy, depending which side you happened to be on. The MacGregors fell foul of (amongst others) King James V1 of Scotland (James 1 of England), the son of Mary, Queen of Scots, and were outlawed. It was forbidden to carry the name of MacGregor and all who were in anyway associated came under the same official disapproval. In 1613 one Finla McJames Uig of Abirnethie, was heavily fined for 'reset of members of the Clan Gregor'. It was probably as a result of official harassment that the 'Og(e)' sept nameholders diminished dramatically in the 17th century. Certainly recordings became rarer and although the ban on the MacGregors was lifted by Charles 1st, it fell again after the 1745. The 'Ogg' name never regained any major popularity outside of Aberdeen. Early examples of the name recordings include Daniel Oge of Templemore, County Londonderry, on December 10th 1642, Jon Og of Aberdeen on October 11th 1668, and Donald Ogg of Strathdon, Aberdeen on November 10th 1668. The coat of arms has the blazon of a silver field, a green tree, crossed with a blue sword fesswise, piercing a red crown. The first recorded spelling of the family name is shown to be that of Donald Oge, which was dated 1457, the inquistion (tribunal) into land holdings in Aberdeen, during the reign of King James 11, of Scotland, 1437 - 1460. Surnames became necessary when governments introduced personal taxation. In England this was known as Poll Tax. Throughout the centuries, surnames in every country have continued to "develop" often leading to astonishing variants of the original spelling.